John Robert Colombo has been called “Canada’s Mr. Mystery” for such publications as Mysterious Canada. Over the years he has edited three dozen compilations of descriptions of weird events and odd experiences recorded by Canadians of all walks of life, from all parts of the country, and from the days of Samuel de Champlain to the era of Stephen Harper. 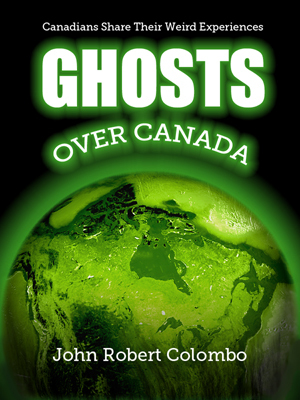 Ghosts over Canada is the latest in this series; it consists of more than 30 brand-new, told-as-true accounts of ghosts and spirits, poltergeists and hauntings, in the words of the informants themselves. This scary book, with a ghostly cover specially designed by Bill Andersen, is available as an Amazon ebook for Kindle readers.